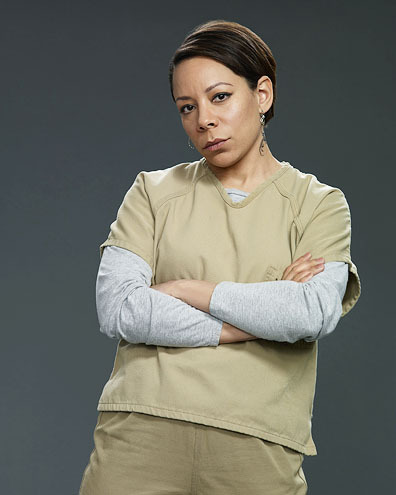 Check out this interview as we got in depth with Selenis Leyva, who portrays Gloria Mendoza in Orange Is The New Black. You have numerous roles to your name, but what made you get into this industry of acting? I knew I wanted to perform at an early age.. It was something I enjoyed doing alone in my room. At the time, I wasn’t aware I was “acting”. It was just a great way to pass time. I’d lock myself in my rooms for hours. Dressing up, acting to the mirror, reading out loud. I would make myself cry a lot, just like the women on the telenovelas my parents watched. There was something about those moments as a child that made me feel alive! I remember watching the show Fame, and I was hooked! I was too young to get the stories etc, but the dancing, music and acting made me fall in love with it! I announced to my parents I was going to go to that HS someday. I don’t think they heard me, or understood. I ended up attending The HS of Performing Arts! My Fame school. By then it was called Fiorello H La Guardia HS. It all started there, my training and the certainty that I was going to be a professional actress. How did you get involved with OITNB? What was the process like? Jen Euston, who cast the show, called me in. I auditioned for another role on the show, which I didn’t get. I was crushed, because I knew it was a good project. NO idea it would be this big a hit! I knew I wanted in though. You learn to go through the “mourning” process for a day when you don’t get something and keep it moving. A few weeks after that Jen called my manager with an offer to play Gloria Mendoza. I knew I had to be on this show. It was a Jengi Kohan project! And I love Weeds! Jen is also so great in casting really wonderful shows, she cast me in Girls as well. What is the atmosphere like on set? We have lots of fun. Great support, so you feel confident about trying different things. We have fun, but we work hard. When cameras are rolling, it’s all business. It’s really like a huge house with a large family running around! It’s great. We hope to see more of Gloria as she is now head of the kitchen. What do you hope to see from your character in season 2? It’s so hard to say what I want to see more of. Gloria is still being developed. I trust the writers so much. I feel they have and are creating really complex beautiful people for us all. So I look forward to the journey. Just happy to be on set and continue exploring . Being in the kitchen is of course fantastic! Now other than Gloria, who is your favorite character from the series? My goodness, this is a hard one. All these characters are so wonderful!! I have fallen in love with all of them!! Love what Jason Biggs is doing! I fell in love with him after watching all the episodes!!! Crazy Eyes and Pennsatucky are delicious to watch! I like Crazy, but the beauty with those two is that it’s so layered! So much happening! As with every one of these characters just when you think you get it, or get them, something else gets thrown in and you think..”wow”. I could go on forever about ALL the characters I swear I would if you let me! Why do you think the series has been such a huge hit among viewers of all backgrounds? There is something or someone for everyone. People have a choice to who they can relate to. And that could change from one episode to the next, and that’s the beauty of this show. You can relate to these characters. It’s real. It’s not always pretty and perfect. You see the flaws. It’s layered just like life. For your role of being confined to prison, how did you prepare, or how were you prepared? I took this role like all my other roles I’ve played. I put myself in that world. By connecting as a person, no judgements! Just human instinct. Yes I’m playing a prisoner, but she’s also a daughter, woman, lover, friend..That has all been taken away now what? I also worked for a theater arts program years ago and I worked with a girls juvenile facility. That was one of the hardest jobs. Here I was with all my freedom and I would go in and work on writing scenes with these girls. Some were scared , all seemed sad, damaged to some point,and yet they were giving me stories, writing acting with me. They were making that environment work for them. They had created a world, a family. It was hard on my spirit to see these beautiful girls locked up. Yet they really gave me so much love. And I bring that experience to Orange. When season 1 was finished filming, what was the overall feeling of the cast? Did you know that you were going to have a hit on your hands? We were very emotional! When I was wrapped and heard those words,”selenis is wrapped for season 1″ I got chills ! I cried that day. I knew I was leaving that set, where I had worked side by side with the most amazing cast and crew ever! I didn’t want it to end. And no one knew what would happen. You never know! I thought it was good, but a hit? I felt it deep inside yes! But one never knows in this business. How has your family and peers responded to you being involved with such a unique series? My family is very proud! They have had a front row seat to my ups and downs in the biz. So they are thrilled! My mom was my date for the premiere, and I will never forget how she turned to me that night after the lights came back on in that theater after the pilot was viewed and she said ” this is a hit” she knew! She was beaming. All my peers want to be on the show! Its great , people have responded in an amazing way. You ladies were renewed for a second season before the first season even premiered! How is the filming of season 2 progressing? Anything we should look out for? That was crazy to hear we had been picked up before it premiered ! Talk about pressure! Season 2 is under way. It’s early in the season, we don’t know much. With the success of the show everything is very hush hush. Which I don’t mind. Its nice to be surprised. I wish I could say” look out for…” but I myself am just finding things out slowly. I’m a Red Sox fan, but you happen to be a Yankees fan! With that being said, what’s your impression of the Yankees this year as the baseball season nears its end? Should we even be talking!?? !Red sox!!haha.. I Love baseball! We have a decent chance to get in the playoffs, Will be fantastic to get our team captain , Jeter back in. Soriano is on fire! Love sushi! And cuban food. Im a foodie! Marc Anthony, pink, Maroon 5 , Beyonce, Adele, La Lupe, Celia Cruz, Hector Lavoe, Oscar de leon, Amy Winehouse, Eminem, Jay Z….I really enjoy all music to be honest, my mood will dictate what i listen to it varies greatly! hmmm.. I co wrote two scripts that I hope to get produced in the near future! This entry was posted in Interviews, Media, News and tagged Crazy Eyes, Jason Biggs, Netflix, Orange Is The New Black, Selenis Leyva. Bookmark the permalink.